On the metro, we pass by a McDonald's ad touting McWrap Chèvre -- the McWrap Goat Cheese. The girls don't know why I'm giggling, as I start repeating over and over in my head, "McWrap." No matter how I try to enunciate, it's still funny as, well, crap. Go ahead and try it. Of course, the word "crap" isn't so bad in France, where it really sounds a lot like crêpe, which does, by coincidence, bring us back full circle, since that's pretty much what a crêpe is -- a French wrap. Was McDonald's actually stupid enough to name a sandwich the McWrap in the US, too? If they did, is it made with goat cheese? And how do the announcers pronounce it?! The girls and I emerge from the metro station and see a McDo's (as the French call it) right in front of us. As we walk by, I arrogantly think, "I will never set foot in a McDonald's in France." I haven't been in one in over two decades, after all. In fact, our children have literally never tasted McDonald's (how very Bay Area food snob of us). About half an hour later, after trying on shoes, both girls suddenly and urgently have to go the bathroom. Yes, of course you know what's coming. Paris has a real paucity of public bathrooms, so we have no choice but to go into McDonald's and use their bathroom. I am not required to buy anything, thank goodness, but still here we are, hanging around in a Paris McDonald's taking a big McCrap. A "crottin" is, for lack of a better word, a turd. This golf-ball sized crottin is not a goat turd, however, but rather a very common goat's milk cheese. And while the word "crottin" most definitely means "turd", the cheesemakers and the people in the region claim that the official origins of the cheese's name comes from the word "crot". A crot is a small oil lamp made from clay used by winemakers to light the cellar and by goatherds to light the barn. To which, I personally, say "ha!" I think this smacks of a marketing ploy to come up a way to distance it from the word "turd". Despite its small size, it has a big presence in France and can easily be found around the country. It also has a big status: AOC since 1976 and AOP since 1996. The cheese has been known to exist for at least a couple hundred years, however, and possibly as far back as the 16th century, when goats first started to be raised in the area. The first official record of it is listed in an 1829 tax report in which an inspector wrote, "their milk is not good to make butter, but with it, delicious cheese is made: in the Sancerrois region, it's known under the name of 'Crottins de Chavignolles'." 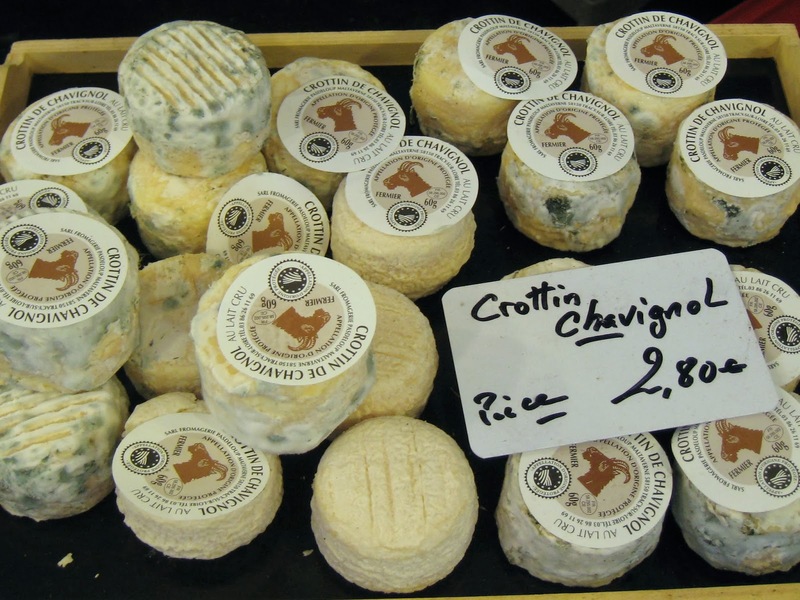 The cheese owes its name not just due to its resemblance to a plug of clay used to make a lamp (snort) or to goat droppings but also to the name of the old village, Chavignol, where it originated. Chavignol is right outside of Sancerre (the place that makes delicious white wines) in the department of Cher, right next to the Burgundy region. This little goat cheese turd may look like a crap, but it's so much better than a McWrap.